Flipping between transmittance and absorbance - The fluorescence laboratory. 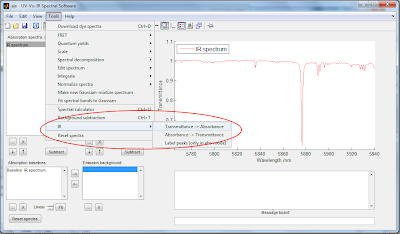 In a|e you can quickly flip between units of transmittance and absorbance. Suppose your IR spectrum is in units of transmittance and you want to display the data in terms of absorbance. 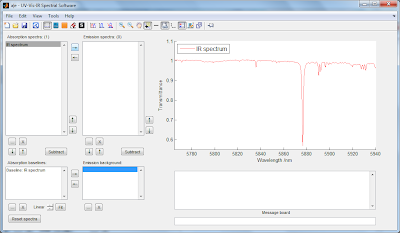 Go to Tools -> IR -> Transmittance->Absorbance. You can equally easy go from absorbance to units of transmittance. 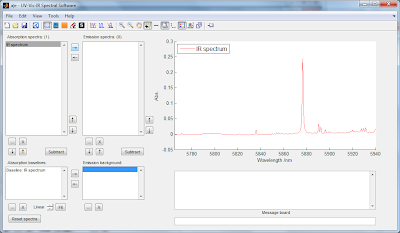 Go to Tools -> IR -> 'Absorbance->Transmittance'.